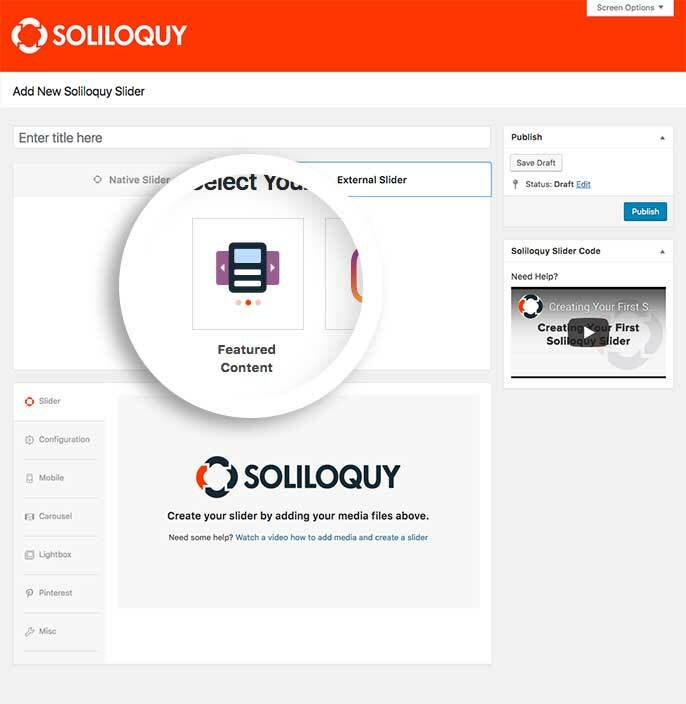 The Featured Content Addon for Soliloquy allows you to easily create sliders from any category or tag on any post type in WordPress! 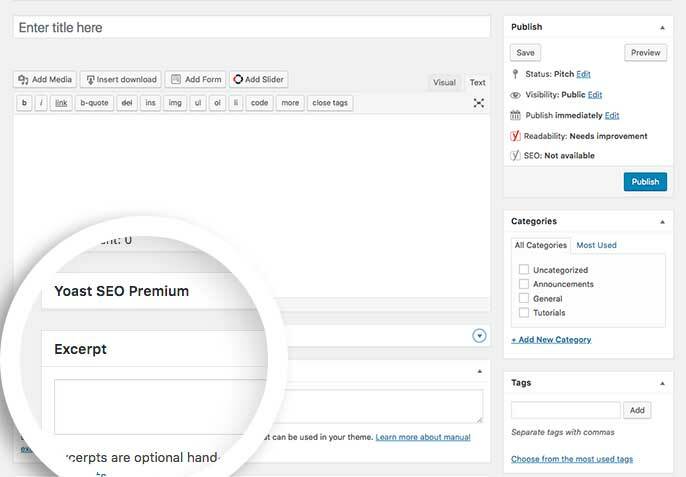 We’ll walk you through how to set up a Featured Content slider! Master, Agency, or Developer Soliloquy license. You can read how to upgrade to one of these licenses here. In this instance, you’ll be activating the Soliloquy Featured Content Addon. Your first step is to create a new slider. 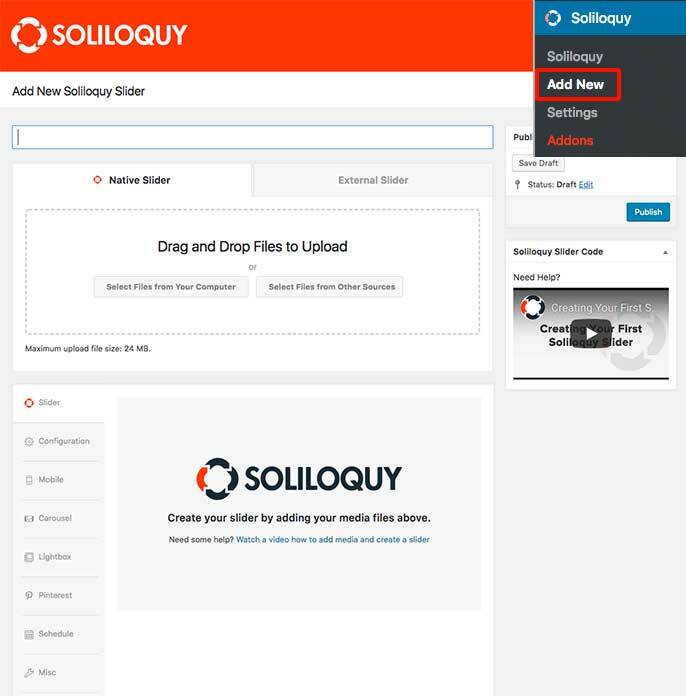 You can do this by clicking Add New under the Soliloquy menu option on the left. Next, click the External Slider tab from inside the Soliloquy and select the Featured Content icon. On the Slider tab you’ll see a list of options to choose from to set up your slider. Finally, click Publish on your slider to save the changes. There are other sliders from the External tab you can great as well. Have a look at our tutorial on How to create an Instagram slider. A: Edit your posts to make sure you’ve set a featured image. Soliloquy will use the featured image of the post type first before checking for a fallback image from the slider settings. 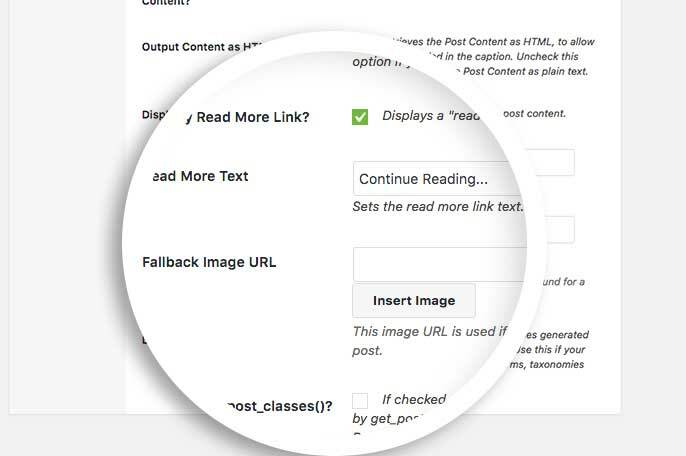 If you’re not using featured images, just edit the slider and set a Fallback Image URL setting from the Slider tab. A: From the Slider tab, make sure if you’ve selected Excerpt from the dropdown, you’ve got an excerpt for your post type. 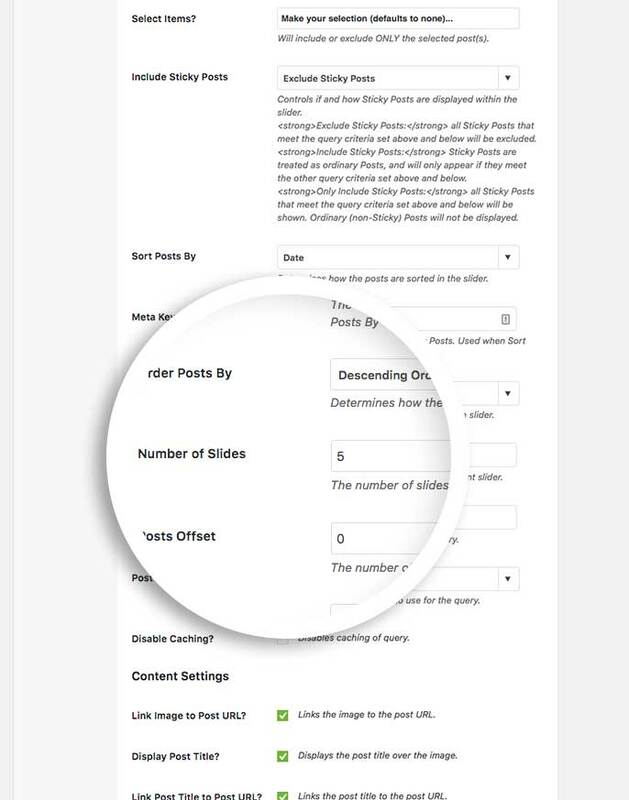 A: When you created the Featured Content slider, the Number of Slides is set to 5 by default. If you’d like to show more, just edit the slider and on the Slider tab, scroll down until you see the Number of Slides setting to change the number of slides to show. Fix: Moved publish_post and publish_future_post hooks into includes/global/common.php, so they fire on front end loading of scheduled Posts (in turn, clearing caches more aggressively). Added: Inclusion / Exclusion supported when more than one post type is selected. Fix: Inclusion / Exclusion Posts and Taxonomies not appearing on dropdown lists. Fix: Taxonomy could not be chosen when multiple Post Types selected, despite those Post Types sharing the same taxonomy. Fixed bug with getting sliders by slug not working with FC sliders. Fixed bug with random queries and caching. Fixed bug with caches not clearing after publishing a new post that would be included in the slider. Fix bug with HTML tags if no content was selected. UI Refreshs for better backwards compat on caption styling. Fixes some UI regressions from v1 to v2. Featured content captions are now wrapped in the appropriate soliloquy-fc-caption class again. Fixed a regression with caption output by wrapping caption content in backwards compat class. Fixed bug (finally) with clearing out transient cache for FC sliders. Fixed bug with grabbing wrong image size if using custom size in Config settings. Fixed caching bug when publishing/updating new posts. 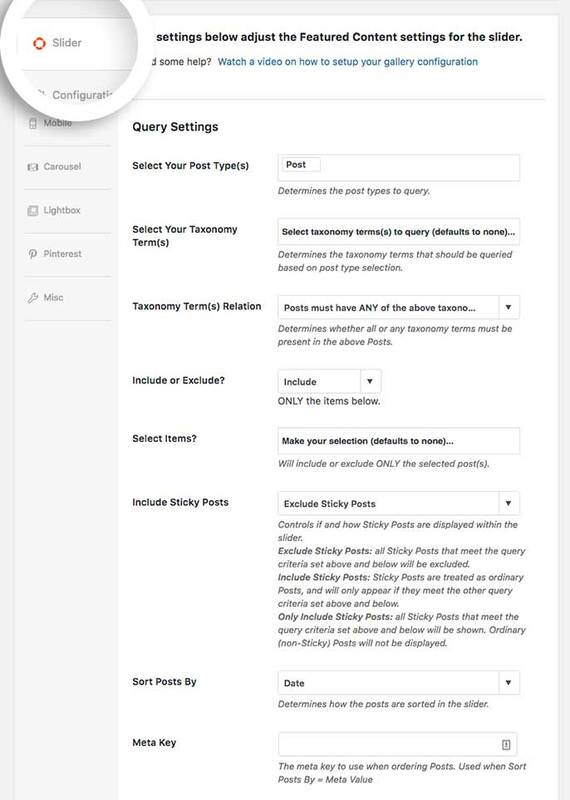 Reintroduced the query and include/exclude option for featured content sliders. Fixed bug with not saving read more text. Fixed bug with PHP warning for errant parameter in function call.